I sit here on the day before the Summer Solstice 2011, June 21, and contemplate how much has been lost on the significance of this special day. As I type, the Earth and the Sun are reaching a perigee of sorts. I know the Earth revolves around the Sun, but on this day because of the Earth’s tilt, the Sun will now be heading south in the Northern Hemisphere. I always think back when this day held great meaning in the lives of mankind. This day was a turning point ~ a time to start thinking about how one was going to make through the coming winter and if they hadn’t started yet, a time to get off their butts and get to it. Both summer and winter solstices were very important days. Unfortunately, now, those days seem to represent just a few typed words on all our bank calendars. We call this day the first day of summer, but as most can honestly attest, we know summer hits its full stride a few weeks earlier than late June. I think calling this day the first day of summer confuses most people whose lives revolve around barbeque and Memorial Day. For them, technically the first day of summer is that Monday off back in May. As humans have progressed over the years, the evolution of technology seems to put less and less significance on the Summer Solstice. Daylight savings time, the 24-hour news cycle and the Internet have all put a hitch in the giddalong of the longest day of the year. I for one have always tried to mark this day. Being an avid Master Gardener, today is the one time of year I go outside and mark the shadow lines at Noon and finally figure out where in my yard the gardening term “full shade” applies. Inevitably when I am running frantically around the yard at “high Noon,” images of Stonehenge and other ancient manmade objects come to mind. Those incredibly large stones standing on end somehow have the Sun appear in some kind of small window. We are talking huge rocks and great feats of engineering to mark the day, so it must have been important for someone to come up with the idea “Hey, let’s mark this day with a large rock and double hernia.” I smile thinking about how projects like this work out for me and the agony of having to wait a year to see if you got it right. Knowing my luck next year, I would have to move it just smidge to the right and spend another year worrying if I moved it too far. I do feel we are losing something by not putting more importance on this special day of the year. I would bet a hundred dollars that most of Nature knows today means something. I am sure migratory birds start thinking like we normally do when we crest that hump day on vacation and we start counting the days before we have to head back home. At least the birds will fly a couple of thousand miles and get some exercise on the return flight I am sure as we round this yearly bend, the significance of this day is not lost on the rest of the environment. Is it me or do we seem to be getting more and more detached from our world’s natural cycles and rhythms? We’re choosing to cocoon ourselves in our homes and further lose touch via cable TV and the World Wide Web. I am convinced that for most people the outdoors is something that happens when they go through a door and the light and temperature changes drastically. I am convinced we are losing touch with very thing that got us here. Nature. Drew Aquilina is a humorist, cartoonist and a couple of other ‘ists’ that he just can’t think of at the moment. The Pond happily welcomes the 2011 Summer Solstice. We use this occasion to introduce a new cartoon strip from international award-winning Cartoonist Drew Aquilina. Here is S.O.Teric! Enjoy. Green Pieces is thrilled to announce that its books will now be distributed by Midpoint Trade Books. Look for Green From the Pond Up, Meet the Pond Friends, One Piece At a Time and many other award-winning collections from international award-winning Cartoonist Drew Aquilina at a bookstore near you soon! The Pond is thrilled to announce that the first edition of Green Pieces: Green From the Pond Up has sold out. We are now on our second printing. Announcing the creation of Green Pieces Cartoon Studio Press. The 2nd Edition of Green From the Pond Up is publishing under that small press with the ISBN: 978-0-9833444-3-8. Order your copy today! Green Pieces: Green From the Pond Up has a new ISBN# 978-0-9666899-7-6. Check back for distribution details through Baker & Taylor and Amazon.com later this Fall. Remember, the new release date is January 2011 ~ in full color! Green Pieces Book Launch Party Set! Please join The Pond at the Green From the Pond Up launch party on Saturday, January 22, 2011, The Phoenix Zoo, 455 Galvin Parkway, Stone House Pavilion. Festivities take place from 9am to 1:00pm. PLEASE R.S.V.P. to mail@greenpiecestoons.com or greenpiecestoons.com. Please let us know how many adults and how many children under 13 will be joining us. GREEN PIECES REALLY GOES GREEN! Green Pieces: Green From the Pond Up has been picked up by a phenomenal publisher ~ Mariposa Press, Inc. Additionally, The Pond has been requested to print its first compilation book in full color. As a result, the book now will be published in January 2011, with all the Pond Friends appearing in vibrant color. Look for details of the rescheduled Book Launch Party in our next post. Remember: If you go green, GO GREEN PIECES! Be our guests on Saturday, September 4, 2010 from 9am-Noon, The Phoenix Zoo / Stone House Pavilion. Join us for the Book Signing ~ Contiental Breakfast ~ Light Tracer Light Box Raffle ~ Pictures with The Pond Friends ~ Fun Fun Fun! R.S.V.P. by Mon., Aug. 9, 2010 to mail@greenpiecestoons.com or greenpiecestoons@gmail.com. REMEMBER: IF YOU ARE GOING GREEN, GO GREEN PIECES! In celebration of the 2010 Summer Solstice, The Pond welcomes you to read the first grouping of reviews and endorsements for Green From the Pond Up! Iggy and the boys are very excited to spend the next several weeks planned their BOOK LAUNCH PARTY which will take place on September 4, 2010. Check back as the details emerge! The entire POND crew and friends will be seeking out new blog friends this Saturday. Enjoy the weekend and take a hike or visit your local park. Visit your local Zoo! Here in Paradise Valley, we are very lucky to have the PHOENIX ZOO, 455 N. Galvin Parkway, Phoenix. www.phoenixzoo.org. Hug your favorite Giraffe today! 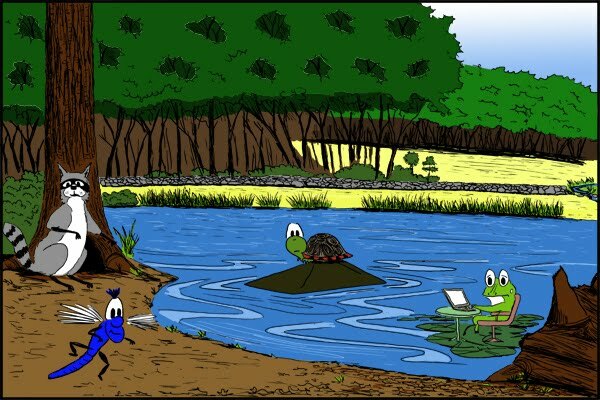 The Pond sends a big shout-out to Iggman Turtle and his ancestors as we celebrate World Turtle Day. Check out www.greenpiecescartoons.com and adopt a Sea Turtle Nest today!